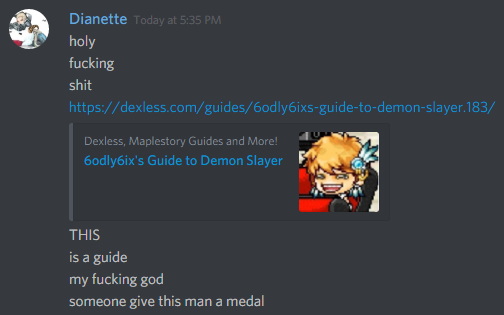 6odly6ix's Guide To Demon Slayer | Dexless, Maplestory Guides and More! Discussion in 'Guides' started by elluci, Feb 8, 2018. @elluci My only worry is that you're using images hosted by ayumilove. If for some reason they close/find out/disable hotlinking/move things those images will die. I know by this point its a huge undertaking though, so here's hoping for the best. Hopefully there isn't any problems using the images from that site. If there are, I could maybe consider orangemushroom also, but its probably safer to capture the images myself. I think it should last a fair while though, since those fan sites have been around for a long time. When the time comes, I'll remake the images to use for the guide. Thanks for bringing that to my attention. one suggestion I thought up: dream defender tips (also something I should add to my own guide). Im sure each class has some optimal way to clear a room or move to reach the portals, plus you have to deal with cooldowns being down for some floors whenever you push for a new record checkpoint. Yes, that should be something I would work on putting into the Gameplay tab. I'll need to think about to approach this though, because I haven't thought about it particularly much since I usually just enter my checkpoint floor and quickly get it over and done with. I think I would like to slowly add in approaches to boss fights/Spirit Savior/Dream Defender in the Gameplay section and commentary about it, but I fear that it may be too long in this section. I'm not sure if some of them warrant an individual guide about them, because I would only be talking about DS's approach to these contents. A reference for myself when I do write this later, is to follow the bossing skill rotation I mentioned in the 'Skill Info' tab, since the main goal is to kill the music box. Demon Awakening and Demon Impact are skills that can hit multiple targets, so while destroying the music box, the monsters should be dead by then. When you must switch to Demon Impact, you may need to use some of the power ups (the 300 one is the only worth using imo) because you are a bit weaker and may struggle until Demon Awakening comes back up. In your spirit savior video how you maneuver in mid air?